Atomizers with bottom airflow have become more and more popular, and we have seen many be released within the last year or two. Many vapers like these style of atomizers due to the great flavor you get while vaping. Hop N Vape has recently released their first atomizer, the Rashomon RDA which does feature bottom airflow and a unique build deck. How does this RDA compare to the rest? We’ll find out in this review. Before getting any further, I would like to thank Hop N Vape for sending this atomizer my way for the purposes of this review. I will go over my first impressions, build and wicking, performance, pros and cons, and conclude with whether or not I recommend the Rashomon RDA! Check out The Rashomon RDA Here! Click Here to Check Out The Hop N Vape Rashoman RDA! 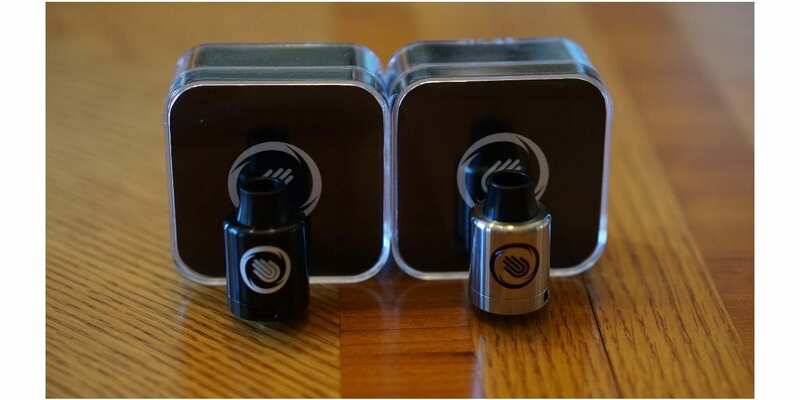 The Hop N Vape Rashomon RDA is packaged in a small plastic box, is available in two different colors, which are black and stainless steel. In addition, this RDA does sport an overall diameter of 24mm, so it will look great on most box mods and mechanical tube mods! Included in the packaging you do receive the atomizer itself, a bag of spare parts, a threaded 510 drip tip adapter, a 510 squonk pin, allen key and a single coil PEEK block. It’s a huge pro in my book when an atomizer comes with plenty of extras, and this RDA certainly comes with a lot. Upon taking this RDA out of the box, I immediately noticed the excellent build quality. For the price of this atomizer, the quality is fantastic. I was actually surprised by how good the quality was. Also, the o-rings are excellent, and makes for taking the top cap on and off effortless. It has the perfect amount of restrictiveness. Also, the top cap does feature a conical design, so I knew for sure this would help increase the flavor. 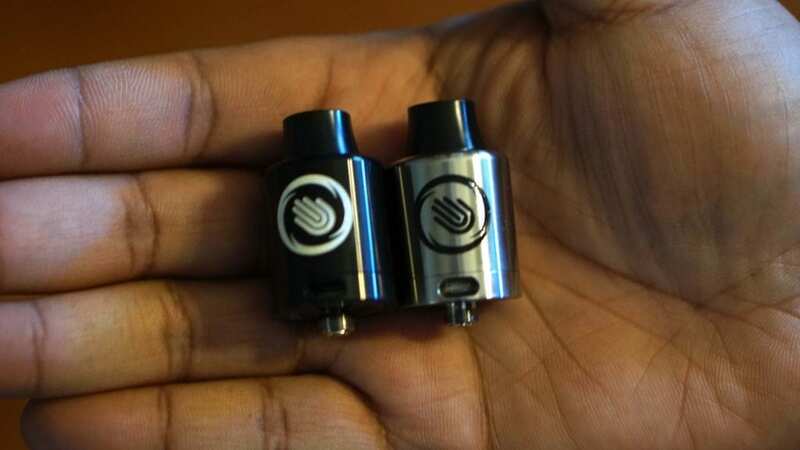 As mentioned in the introduction, the Rashomon RDA does feature bottom airflow, but it is not adjustable which can be seen as a con for sure, as I know many vapers prefer to have the ability to adjust the airflow on their atomizers. The bottom airflow holes are quite large, so I was expecting a good amount of airflow with this atomizer. This RDA does come pre-installed with a wide bore delrin drip tip, which is a huge pro to me. I highly prefer delrin over stainless steel, and even if you didn’t like this drip tip, you can just install the threaded 510 drip tip adapter, and use your own preferred 510 drip tip. This is yet again another huge pro for this RDA! The build deck is definitely unique with this atomizer, and it does kind of remind me of the build deck on the Recoil RDA, where the top lead goes into the higher post hole, and the bottom lead goes into the lower post hole. Just by looking at the build deck, I already knew building on this atomizer would be easy. I do want to mention that this RDA did come clean with little to no machine oil, which is a huge pro in my book! One wash with warm water and soap, and the Rashomon RDA was good to go! All in all, my first impressions of the Hop N Vape Rashomon RDA were positive! The overall build quality was excellent, and it came with a ton of extras! As mentioned previously, the Rashomon RDA does feature a unique build deck, and with this style of build deck, it makes for installing coils a breeze! The top lead of your coil naturally makes it way to the higher post hole, and the bottom lead will just fall into the lower post hole. The screws are excellent, and you can really tighten down with no issues to ensure a good connection. Honestly, I would say that beginners would have little to no issues with this build deck, and experienced user will have literally no issues with installing coils on this atomizer. It’s probably just as easy as a velocity styled deck in my opinion. Also, there is a ton of room to build and the post holes are of a generous size, so you can easily fit Fused Claptons and Alien coils with no issues. 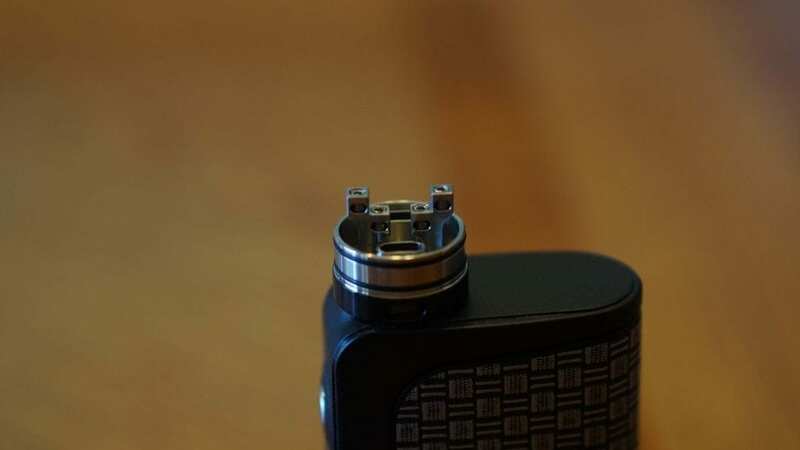 Wicking the Rashomon RDA is also very easy, and there’s a ton of room for cotton. You can simply cut the cotton a bit past the build deck, fluff it out, and insert the cotton gently next to the sides of the airflow hole. There is also room to place cotton underneath the area of the top post holes due to the way it’s designed. Building and wicking this RDA could not be easier, and this is a huge pro to the Rashomon RDA. It took me five minutes to have everything done, and ready to vape. Overall, both beginners and experienced users won’t have much issues or none at all when it comes to building and wicking the Rashomon RDA. The unique build deck makes it easy to install coils, and there is a ton of room for cotton. Use Coupon Code VC10 For 10% Off! The most important question of this review is probably how does it perform, and I can easily say this RDA has fantastic performance! My preferred coil build was a dual Clapton build (24GA Kanthal/ 36GA Kanthal) which had a resistance of 0.23 ohm. This was a 8 or 9 wrap Clapton build, and I had more room to add more wraps if I wanted to, just to give you an example of what kind of builds can fit with no issues. I did try other coil builds as well such as 22GA Kanthal, 24GA Nichrome 80, and a Fused Clapton build, but I just preferred this specific build. All of these build had excellent performance in my opinion, I just liked the ramp up with my preferred coil build. With the dual Clapton build, I preferred to vape it between 65w and 90w. At higher wattages I got a nice warm and flavorful vape, and at slightly lower wattages the vape was a tad bit cooler, but the flavor was still great. Speaking about flavor, the flavor I got off of this RDA was fantastic, and I was expecting it to be due to the bottom airflow and conical top cap design. The vapor production was also top notch with this atomizer, especially with a dual Clapton build. Of course with higher wattages, I was able to get even more vapor production. In regards to both flavor and vapor production, the Rashomon RDA will surely not disappoint. As mentioned previously in this review, this RDA does not have adjustable airflow. Even though it does not, I probably would not adjust it due to the specific builds I preferred in this atomizer, and I did enjoy the airflow just the way it was. The airflow does have a very slight restriction to it, which is perfect for cloud chasing. I would say the airflow is more on the airy side, so if you like a lot of airflow, you’d love the Rashomon. However, if you like a very restricted draw, then this atomizer would not satisfy your needs. I did not use the single coil adapter as I prefer dual coil builds, but I think it’s a huge pro that they included it. 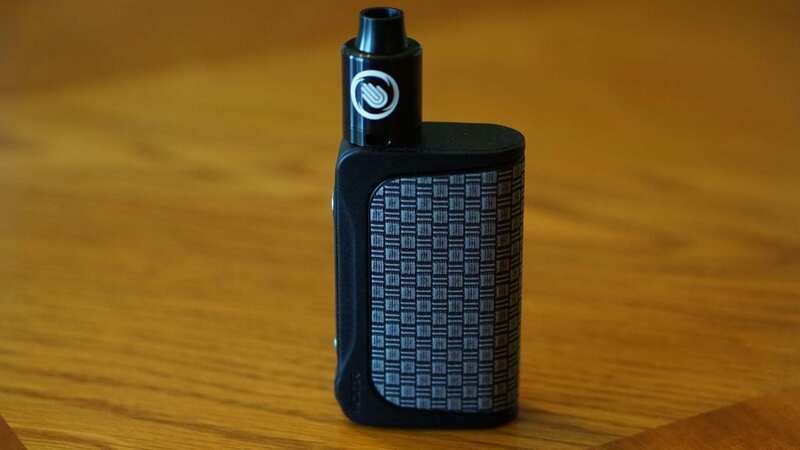 In addition, if you wanted to squonk with this RDA you can since it does come with a 510 squonk pin. I did use this atomizer with a squonk box mod, and it worked just fine with no issues, so if you’re planning on purchasing this atomizer and use it for squonking, you won’t have any issues. The included delrin wide bore drip tip is comfortable to use, and I do prefer these style drip tips. 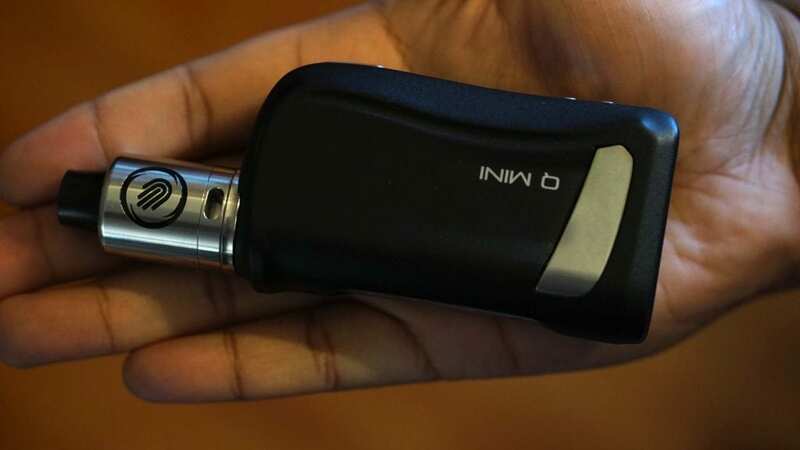 The drip tip never got hot either when vaping at higher wattages, and it is to be expected since it is delrin, but still something worth mentioning. I honestly found no need to use the included 510 drip tip adapter with the Rashomon RDA, but it’s still a pro that you have that option. I do want to mention that if you over-drip it will leak. This has happened to me a few times, so be mindful of how much e-liquid you put into this atomizer. Also, if you are “painting” your coils with e-juice, make sure it doesn’t fall into the airflow hole either, as it will just leak. This is not really a con since it can be seen as user error, but something like this is to be expected sometimes with bottom airflow atomizers. I think this RDA is a bit more prone to leaking simply because the airflow holes are quite large, so e-liquid can easily make its way down and leak right out. All in all, the overall performance of the Hop N Vape Rashomon RDA was solid. The flavor and vapor production was top notch with this RDA. In conclusion, the Hop N Vape Rashomon RDA is a solid performing 24mm atomizer. The flavor and vapor production I got from this RDA was excellent, and the fact that this RDA includes a ton of extras is a huge pro! If you prefer single coil builds, this RDA has got you covered with the single coil adapter, if you want to use it on a squonking box mod you can with the included 510 squonk pin, if you like using your own 510 drip tips, you can simply install the 510 drip tip adapter. With all of the included extras, this RDA is very versatile, and it will cover most of your vaping needs. Even though the Rashomon RDA had a couple of cons to be mentioned, it really does not take away from its incredible performance. The leaking issue is simply from me dripping too much e-liquid at times, and that’s the only time it would happen. I know that many vapers like to adjust their airflow, but in my opinion it has a great amount and for my vaping style and preferred coil builds, I had no need to adjust it. Considering the price of this RDA, it’s really hard to beat in my opinion. All in all, the Hop N Vape Rashomon RDA is an excellent all around RDA. If you’re looking for a new 24mm atomizer that comes with tons of extras and has bottom airflow, then I can highly recommend the Rashomon RDA!